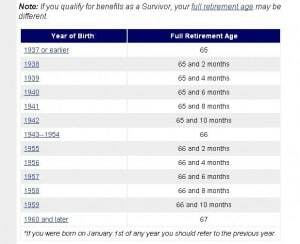 If you want to know when to take Social Security benefits, the answer is “as late as possible” up to age 70. This is true in almost all cases (I’ll discuss when you should not adhere to this advice.) The issue of when to take benefits isn’t a question of how to maximize your income. It’s a question of how to minimize your risk. Let me explain. This “full retirement age” is the age at which you’ll get 100% of the benefits you’ve earned. If you retire prior to that (the earliest is age 62), your benefits will be reduced. If you retire after that age, you will receive more monthly income. Keep in mind that all future benefits and cost-of-living adjustments are built around the age at which you retire. That’s why this is so important. Want to know exactly how much your benefits are reduced by if you retire prior to your full retirement age? Let’s assume you were born after 1960. If you apply for SSI benefits at age 62, you’ll only get 70% of what you would receive at full retirement age. And your spouse would only get 32.5% of what he or she would get in Social Security spousal benefits. If you retire at 65, you get 86.7% and your spouse gets 41.7%. So let’s go back to our example of the person born in 1960. Her full retirement age is 67. If she delays retirement until age 70, she’ll receive 124% of the monthly benefit she would have received had she retired at 67. (And the annual cost of living adjustments will be larger as well.) Let’s put this in dollars and cents. You can see that Mary has a strong incentive to delay making a claim until age 70. You might ask, what if Mary dies the day after she reaches age 70? She could have received all those benefits from age 62 through her date of death. But because she waited, she didn’t get a dime. This is true. And if you know exactly when you are going to die, it makes planning a whole lot easier. But most of us don’t know when we’re going to pass away. As a result, you have to plan for the “worst financial case.” The “worst financial case” is that you’re going to live a very long time and need to support yourself. If that happens, you’ll be far better off with the extra retirement income. If you don’t live long, don’t worry. You won’t know the difference. The bottom line is that you should delay taking your Social Security benefits until age 70. When should you ignore everything I said above? If you absolutely need that extra income right now, get your Social Security ASAP. In this case, you don’t have an alternative. Also, if you are ill and have limited longevity, you might go for the benefits now. But for most of us, delaying Social Security benefit claims is the way to go. Where do you stand on this issue? When are you going to take your benefits? Why? Neal, very good article; however, You mention how much the spouse can get if you start before full age, but not after that. For example even if you wait until 70, the spouse rate does not go up, but remains the same as if you had taken yours at 100% and that remains the same for the rest of her life. I thought the increase would benefit her for life. Wrong! Excellent point Chuck – and one I had not considered! Thanks for bringing it up sir.